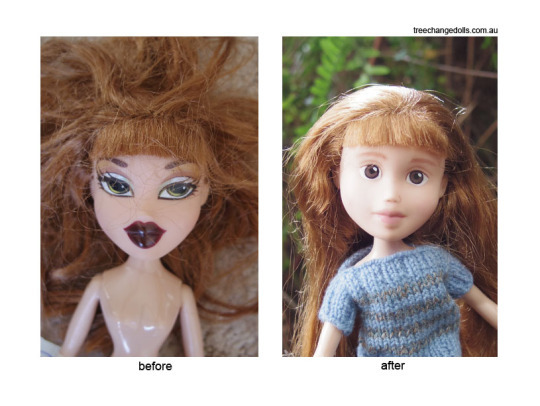 An Australian woman has gone viral for her doll makeovers, although in this case, they are makeunders rather than makeovers. 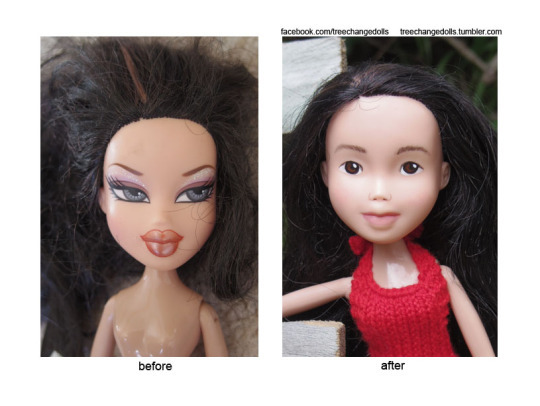 She finds second-hand Bratz dolls, removes their face paint, paints on a new face, and her mum knits the new clothes. The transformation is quite remarkable. It’s hard to even believe they are the same dolls. 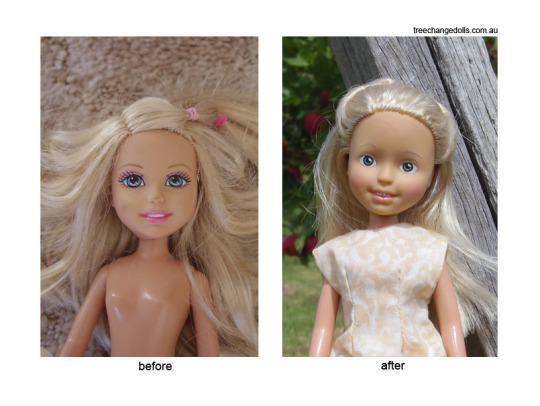 The make-under dolls are a huge improvement on the original in my opinion. Aside from having a ridiculous amount of makeup for a doll, the original Bratz dolls are just plain ugly. I showed my kids these photographs and asked them which they preferred. Elizabeth said she liked the dolls on the right because the other ones “are ugly”. Daniel also chose the transformed dolls because the original ones “look funny”. Posted in Journal and tagged dolls, makeunder, recycling, toys, Tree Change Dolls. Bookmark the permalink. I’d never seen or heard of them either and I’m quite glad of that. The original dolls are the stuff of nightmares! Yes, they do look happier after the change, I agree. I’d never heard of Bratz dolls either and thank goodness for that! I definitely won’t be buying any for my kids. Wow That is amazing! Must say I prefer the Under-made dolls! They look more like dolls I saw as a kid. (I wasn’t keen on dolls myself) The new dolls are really freaky – and setting girls up to be disappointed in their looks and figures! When my oldest was younger she had some of the Bratz dolls. There were even some cartoons made about them. I was very glad when we could get rid of them. The dolls are lovely and so is their maker. The husband is really sweet too. Hope she willingly put her hand up for a redundancy at CSIRO. The government here has absolutely trashed science and cut CSIRO to shreds. When I heard her say she had been made redundant I instantly thought of Tony Abbott and his disdain for science. I hope his days as PM are short. Couldn’t agree more. The whole bang lot of them. Women do make-up and I don’t think women do any wrong things at all. I don’t have any objections to make-up and I wear it myself but there’s make-up that has been attractively done and make-up that has been unattractively done. The Bratts dolls fall under the latter category. Cute! This is a bit like RL – I run a self-esteem group at school and when discussing looks, they seem to prefer their friends to look more natural eg hair colours.